Not all of the great houses of the Caribbean are in the former British colonies. Estate Whim Museum is located near Friedrikstad in St. Croix in the U.S. Virgin Islands and is an extensive restoration of a Caribbean sugar plantation. The plantation was first laid out by the Danish West Indian Company in the 1730s as a cotton plantation. 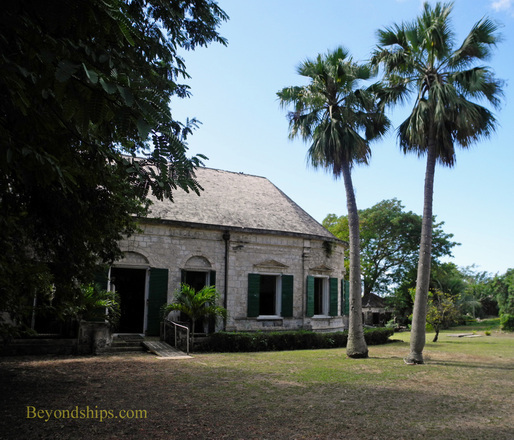 By the 1750s, it had become a sugar plantation and in the 1790s, Christopher MacEvoy, a successful planter of Scottish/French ancestry built the great house that we see today. What is immediately striking about this stone house is that it is oval in shape. Some historians say that it is Danish in style while others say it is French. However, a more practical explanation was offered by our guide who pointed out that a house with no corners is more streamlined and soi less likely to be damaged in a hurricane. Her theory that the design stems from the weather is supported by the fact that the walls are 30 inches thick. Inside the rooms are spacious with 16 foot ceilings. There are only a few rooms in this one level house but it nonetheless has a elegant aristocratic feel. This is in part thanks to the collection of 18th and 19th century paintings and furnishings that was assembled by the restorers of the house. Outside the great house are a number of supporting buildings including the kitchen and slave quarters. Further away, across the lawn is a restored windmill, an animal-powered mill and 19th century machinery used in processing the sugar cane harvested in the fields of the estate. Whim is a more serious educational experience. No rum punch was offered at the end of the tour. However, the guides were well-spoken and able to bring the estate alive with stories of the owners. Also, a pianist playing classical pieces on the drawing room piano helped to recall the bygone atmosphere of the great house.